Tac Force Blue Streak Speedster Assisted Opening Folding Karambit - Blue | BUDK.com - Knives & Swords At The Lowest Prices! With its handy folding design, the Blue Streak Karambit from Tac Force lets you safely carry all the menace, potency and ferocity of the legendary karambit in your pocket anytime, anywhere. It may be easier to carry, but rest assured, the Blue Streak packs every bit as much stinging and cleaving punch as a traditional fixed blade karambit. It boasts a sinister-looking, razor sharp 2 1/2" blade with the iconic raptor talon form characteristic of all karambits. A gentle nudge of the convenient thumb stud or flipper sends it flying open at lightning fast speed, thanks to Tac Force's exclusive "Speedster" assisted opening mechanism. Forged from resilient 3Cr13 steel, the Blue Streak's blade features a stylish two-tone finish - blue TiNi-coated edge and spine, offset smartly by satin finished stainless steel. The two-tone color scheme is echoed on the handle with blue lines on a satin stainless background. The distinctive handle design yields a cool motion effect, as the "blue" lines seem to "streak" by. No karambit is complete without the distinctive finger ring, and the Blue Streak makes no exception. 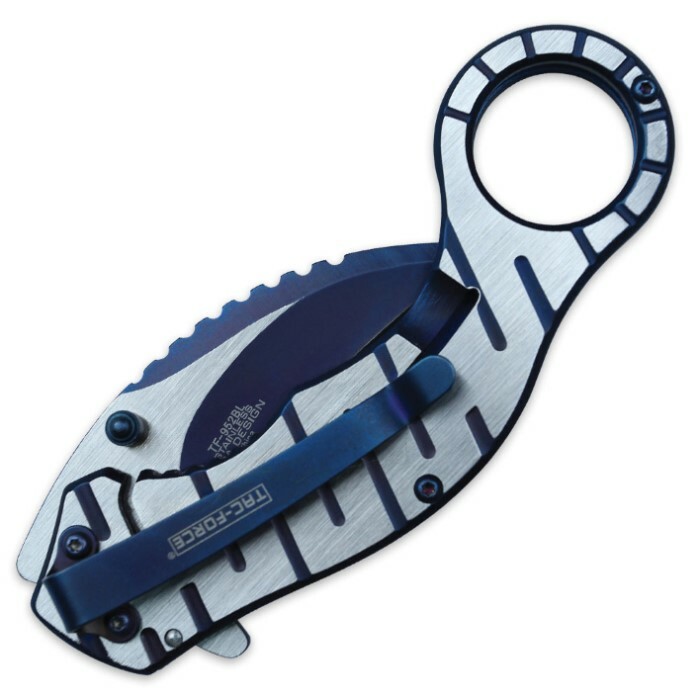 Unlike more traditional fixed blade karambits, at 4 1/2" long, closed, the Blue Streak Karambit fits easily in jeans pockets, especially with the integrated pocket clip. 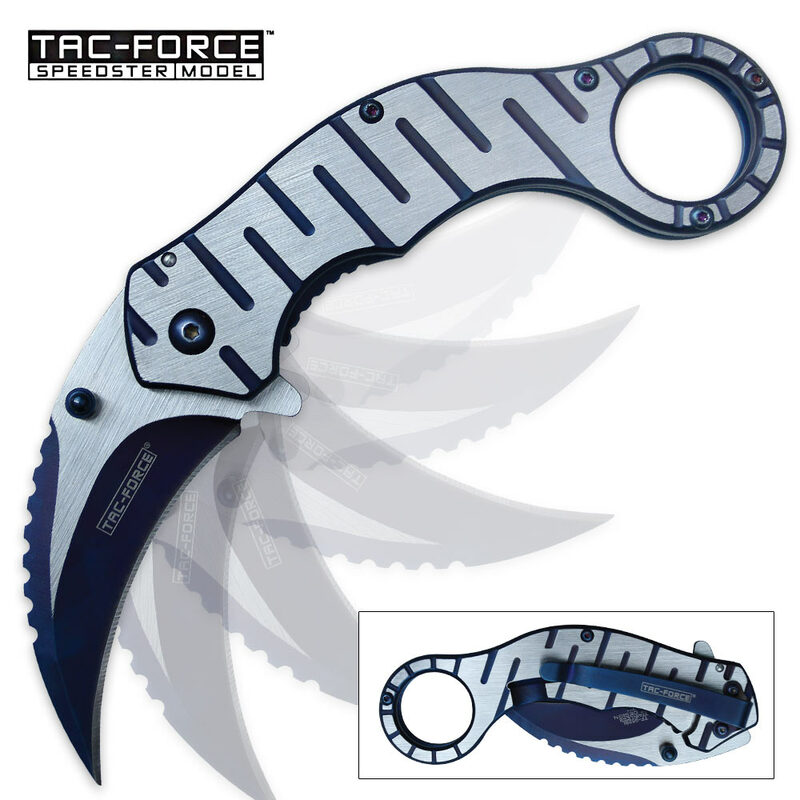 Thanks to Tac Force's folding Blue Streak, the storied karambit can now be anyone's everyday go-to pocket knife!